As moms in charge of keeping kids and homes happy, healthy and well… alive—there are lots of things that fall under our roles and responsibilities on a daily basis. Staying organized and getting it all done is hard enough with one child, but add in multiple and it becomes exponentially more difficult. This makes finding ways to simplify mom life essential to mom’s sanity and success at keeping things running smoothly! I am excited to have partnered with Baby K’tan for today’s sponsored post. This post also contains affiliate links. In the past month since becoming a mom of 2, I have experienced all of the thoughts a mother in transition goes through. From the “I got this” when both kids nap at the same time, to the extreme desperation of not being able to attend to the needs of both while completing other necessary tasks at the same time. I knew ahead of time that simplifying our home and routines were going to make the transition easier, and—for the tasks I was able to accomplish during pregnancy—they really have helped. I still have quite a long list to tackle, but a few things have made a big impact over the course of the last month. Here are the top 5 things that have helped to simplify life and made my transition to caring for a newborn and toddler a tiny bit easier. In my work life, I love using a planner—I keep it on my desk and use it to track ideas, appointments, and projects. The days I forget to use it are always the days that something slips through the cracks. In just the past few weeks since bringing Ellie home, we have already had 2 doctor appointments attended, 3 more scheduled, a visit with the lactation consultant, plus a long list of must do’s for Charlie before she starts preschool next week. Add on to that bills, planning an upcoming vacation, blogging, preparing plans for my maternity leave—and doing all that with almost zero sleep—and details were bound to be forgotten. A dedicated planner for home life became a must-have item. It stays on my kitchen table where I can easily jot down anything that comes to mind when it happens. There are lots of great planners out there (currently I am using this one) but anything with a full month’s calendar and space for daily tasks and other priority to-do items will work. Another thing that has helped life run more smoothly is having a stocked diaper bag ready to go. Trying to get out of the house with two kids has been no less than a circus on multiple occasions. Between a toddler who has suddenly started refusing to get dressed and leave for even the most fun outings to a baby who always needs to eat right when trying to leave the house (and then, of course, spits up once in the car seat) it can take forever. 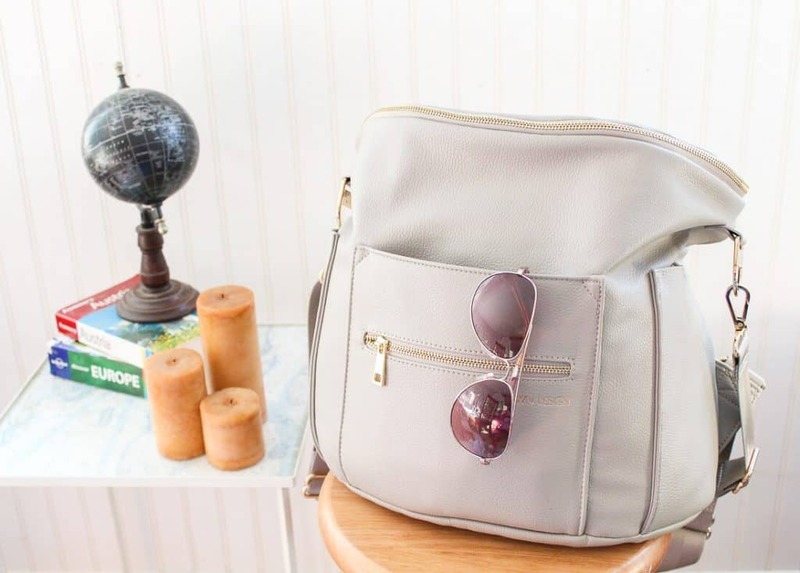 I’ve found that keeping my diaper bag stocked—by restocking each night—saves me from having to do one less thing amidst the chaos. All I have to do is add outing specific items and we are good to go. I also keep a stocked toddler bag ready to go for Charlie since she has been spending lots of time at Grandma’s this summer. Inside the house, I have diaper changing baskets/areas in the nursery, master bedroom and living room. This keeps me from running to another room during a blowout and lets us continue with whatever activity we are doing without missing a beat (especially helpful for when playing with Charlie in the living room). I also restock each of those when I notice one getting low as well. In the storage shelf under the bassinet in our room, I keep extra PJs, swaddles, burp cloths and a sweater for me so I can quickly access anything during our long middle of the night awake sessions. Ellie has a tendency to spit-up, and those first few weeks especially we were going through 2 or 3 of each every night! There is also a breastfeeding basket tucked into my wardrobe filled with snacks, water, and lanolin cream too to make nursing at night easier. These stations and baskets are an easy way to make repetitive tasks easier on everyone. 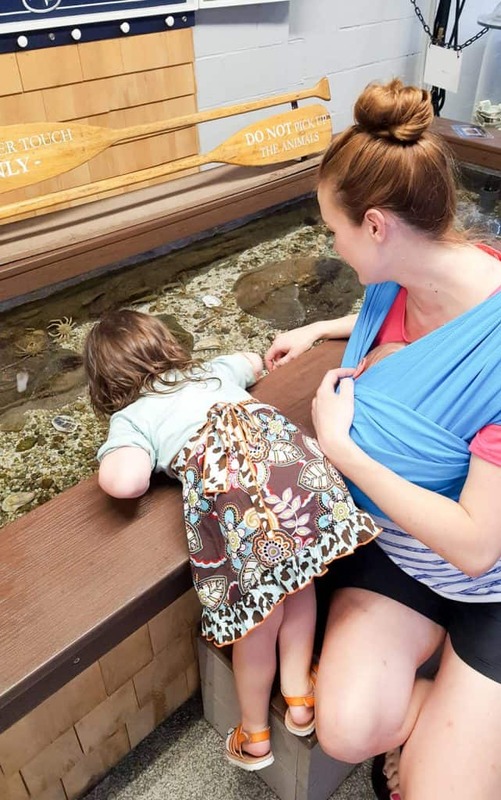 It’s no secret that I love babywearing—baby carriers were one of the first things that got me hooked into the baby gear space to begin with when Charlie was born. I knew babywearing was going to be not only important with baby #2, but absolutely lifesaving! Trying to take care of a baby with a toddler running around is no joke. Gone are the days where I can lounge around staring at my newborn’s little features without having my attention pulled away by something else. Now I am literally begging Charlie to stop using a hockey stick as a pirate sword and trying to explain why climbing on top of her play kitchen isn’t the greatest idea. All while holding (and likely nursing) a newborn. Babywearing is no longer just enjoyable. It is essential to the survival of everyone involved! From the very first day home I started babywearing again to get Ellie snuggled close, and to provide me with free hands to get stuff done. I love that I am able to keep her right with me and help her feel secure while also being able to interact fully with Charlie. It allows me to develop my new bond with Ellie while maintaining and growing my connection with her sister. 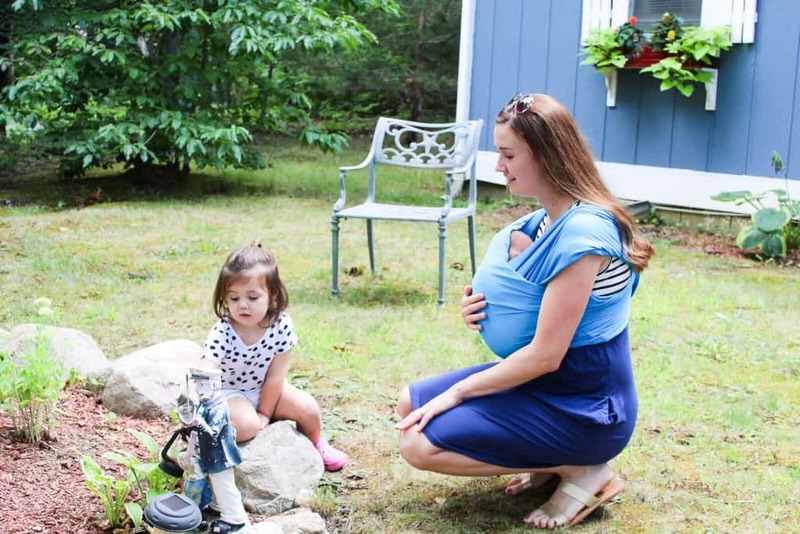 One of my favorite baby carriers for the newborn stage with Charlie was the Baby K’tan Baby Carrier—it provides all of the comfort and coziness of a wrap without the mounds of fabric or difficulty in tying. I had the original Baby K’tan Baby Carrier with her, which I am still using, and this time around I also added the Baby K’tan Active to my arsenal. My Baby K’tan Baby Carrier also allowed us to get out of the house right from the start—which anyone with an active toddler knows is absolutely essential! Babywearing is a great way to simplify outings as it cuts down on the need for a stroller and gets a baby out of the car seat as well. We needed regular outings (to save everyone’s sanity) and starting at 5 days old we hit the splash pad with me wearing Ellie. 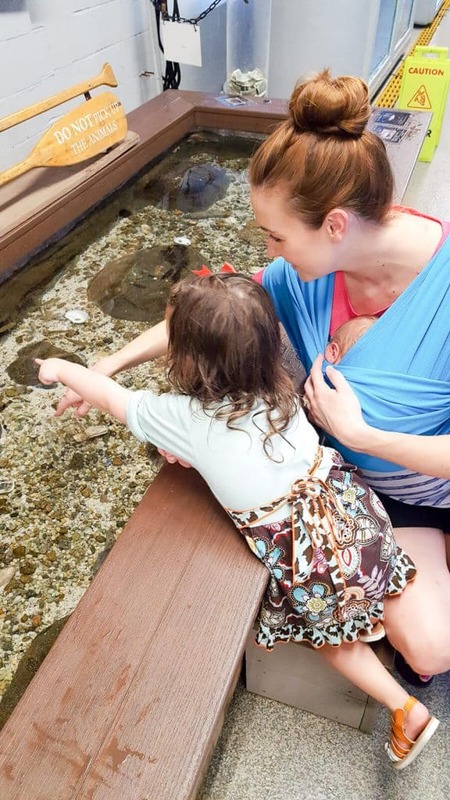 She also had her first visit to the local aquarium a day later, plus the beach, many trips to Grandma’s house, and went shopping too—all in the first 3 weeks! This summer has been HOT and though we are mindful and only go out for short periods of time, the mesh fabric of the Baby K’tan Active allows for airflow and keeps both of us much cooler when out in the heat. It actually blocks up to 90% of UVA & UVB rays and is moisture wicking, which is great for summer or being active (even if that activity is chasing a toddler!). Baby K’tan has a wide range of carrier fabrics and styles to choose from, so head over to their site to find one that you are sure to fall in love with! The last thing that has helped simplify life was simplifying my wardrobe. Living in a 2 bedroom house with small closets meant I shared closet space with Charlie the past few years. With Ellie’s arrival, however, it was no longer practical. We updated the dresser in the girl’s room when we created the shared nursery/toddler room and decided to replace the dressers in our room as well. I ended up getting a wardrobe from IKEA which provides both hanging and shelving space and decided while moving my clothes to really be mindful of what I was putting in there. Since I would be recovering postpartum and then nursing (hopefully for a long time like last time) I took a more minimalist approach and only added items that I knew I could wear now or after a few weeks postpartum, like this nursing dress which I wear almost daily. In essence, I created a postpartum mom’s capsule wardrobe. And it has made a huge difference! Now instead of digging through mounds and mounds of clothing that either doesn’t fit or doesn’t work for breastfeeding, I am able to really see everything that I have and make a quick choice out of the limited choices that made the cut. When I typically have less than 5 minutes to get myself ready, every second counts! It also has (mostly) prevented me from trying on and getting aggravated about clothing that won’t fit for a while—key word there is mostly! Capsule wardrobes have been a big part of my packing routine for travel, and I definitely think all moms should try one out to streamline daily outfits as well. Motherhood is hard enough. It is easy to get overwhelmed and wrapped up in all of the demands that come with mom life. Finding little shortcuts, sanity savers, and items that make life easier helps keep a household running smoothly while giving mom a little more time to breathe and enjoy this phase in life. Because after all, when it boils down to it, it isn’t about the tasks we completed, the laundry we did and whether or not we maintained a busy schedule—it is about the joy we experience spending time and experiencing life with our littles. 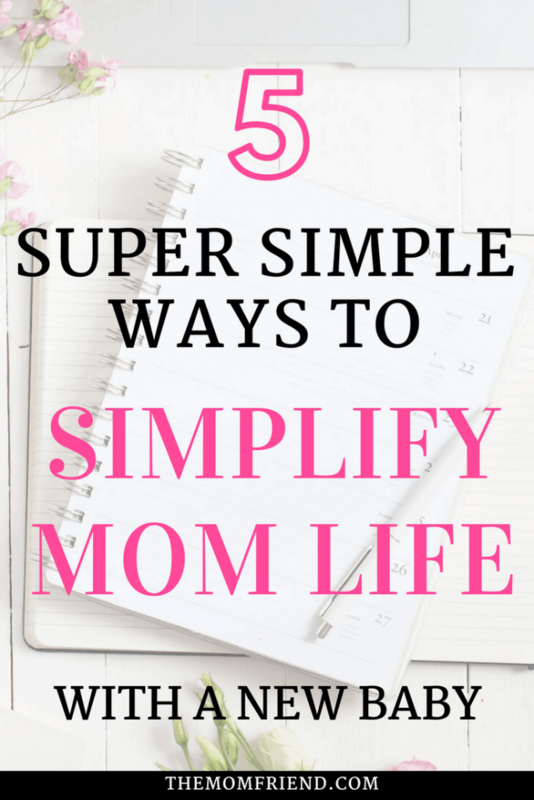 What things or hacks have you found that have helped simplify your mom life? Let me know below and be sure to follow me on Instagram where I’m sharing stories of motherhood that many moms can relate to! Yes is it so helpful! Love that is can be worn so many different ways to grow with baby as well! Thank you! That is my goal for sure! Great tips! I wish I would have simplified my wardrobe right after the babies. It would have saved me some stress and clutter for sure. Now I just need to work on actually doing the laundry… when you have less clothes it is much more noticeable when nothing is clean! I wish all this information was around when I had my daughter 32 years ago. I am so proud of all new moms who help one another through blogging and offering ideas that help struggling moms. Kudos to you! Thank you! I feel lucky to have the internet at my fingertips now as a mom, it helps for sure! So many great tips! I personally love the baby wearing and keeping the packed diaper bag and toddler bag. These are all really great tips! The Baby K’tan Active Carrier is my favorite with our youngest, too! I love how easy it is to use, how comfortable it is, and how happy my son is in it (he’s almost 8 months old and we still use it regularly! Yay! I love it too. So happy that I got to try the Active fabric this time, it is great for moms on the go and adventures!